'A thankless task.' 'A waste of time.' Two of the ways worn out people have described the Christian training of children. You don't have to feel that way! In this book you will find encouragement, practical help and biblical principles. You will also go away with a new vision of the importance of the work in which you are involved. C.H Spurgeon shows us that telling young people about Jesus is the most important task given to anyone, be they parent, teacher or youth leader. 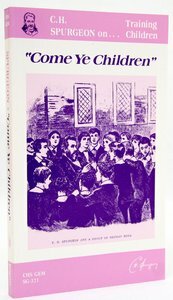 About "Come Ye Children (Converting & Training Children)"